There will be a few new faces in the cast this year and a few new characters from out of the past. Information on ticket sales, parking and times will be posted here and on the B&B site soon. The first performance will be at 10:30 a.m. on Wednesday, August 4th. This will be the fourteenth year that the house on Second Street has reproduced the historic details of the famous case in an entertaining and educational way. 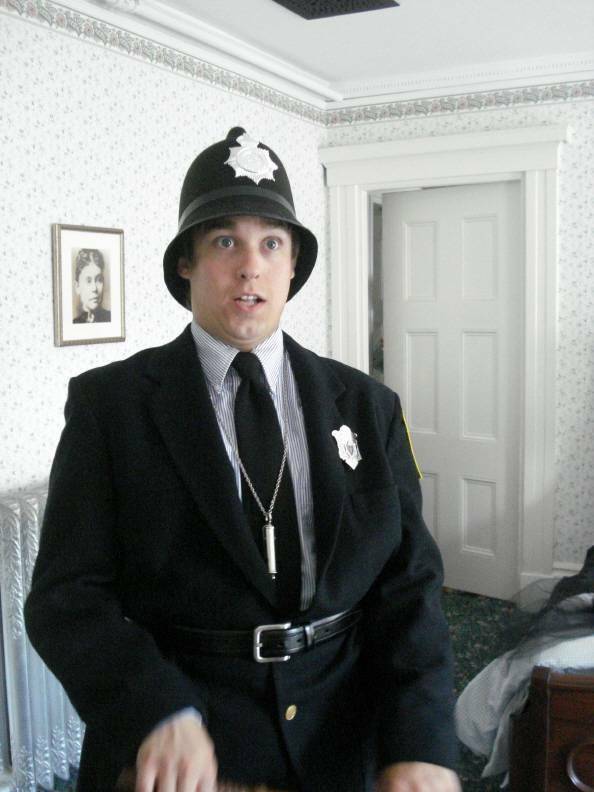 Chances are that if you only take the day tour at the Lizzie Borden Bed and Breakfast, you have missed meeting one of the great assets of the establishment, longtime head chef, Dave Quigley. Dave and the B&B started out together on the same day back in 1996, and Dave is the longest -serving employee of the business. When the house first opened its doors, Dave would come on duty at 10 p.m. just as the night tour of the house ended, and would spend the “third shift” perched uncomfortably on the narrow, hard Victorian sofa in the parlor, watching the tiny television set which received only 3 channels with rabbit ear antenna. Dave was oncall to answer a million questions from overnight guests and deal with all the night time emergencies that can happen in an old house. “How do I get to Salem?”, “Where is Bellevue Avenue?”, “What’s a jonnycake?”, etc. and many other pressing inquires Dave had to field every morning. 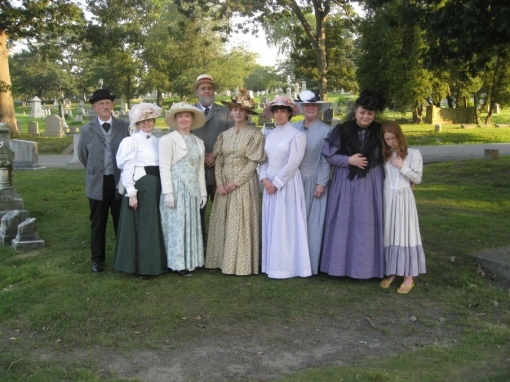 All these he answered cheerfully with good humor and an amazing talent for knowing the best places to eat, the best routes to take to most of New England attractions, and the usual queries about the Borden case and the house in general. Dave became a master of all trades by necessity. Leaky faucets, plugged up toilets, fire alarms going off in the night, special requirements from guests, unwanted visitors, power blackouts, snowstorms – Dave saw it all. And in the process probably flipped over 100,000 of the famous cornmeal jonnycakes. Foremost and primarily, Dave loved to cook and chat with the guests. Sometime’s Dave would forget the jonnycakes while visiting with the guests and the smoke alarms would sound, bringing the Fire Chief to the door in full gear, wielding an axe. Memorable moments. The menu has not changed much since opening day: scrambled eggs, homefried potatoes, sausages or Canadian bacon, coffee, tea, fruit cup and jonnycakes, the last item served to the Bordens on the fateful day. Dave used to love to tell the story about jonnycakes, a local delicacy and an acquired taste. “Journey cakes, they were called because they could travel a long time in a saddlebag on a long trek”, Dave would intone every morning. “Put some maple syrup on ’em- then they have some taste”. Over the past few years Dave has been spared the hard sofa overnight, and arrives about 6 a.m. to get the coffee machine going for early risers. Chefs in training, Will and Logan, will be taking over for Dave next weekend. Here’s wishing Dave many happy golfing days on the greens, big wins at the casino, and relaxing hours with lovely wife, Jean. Best Wishes! Dave’s old black gas Glenwood, once found rusting in a field in Vermont and refitted for gas pipes. “She’s temperamental but works like a champ if you know how to appease her”! Dave (on the right) as Uncle John Morse, August 4, 2002. Today’s ProJo (Providence Journal) carried a story about the recent Lizzie Borden merchandise patent granted to the owners of the Lizzie Borden Bed and Breakfast Museum in Fall River. There’s bound to be more about it in the future! August 4th is coming soon! 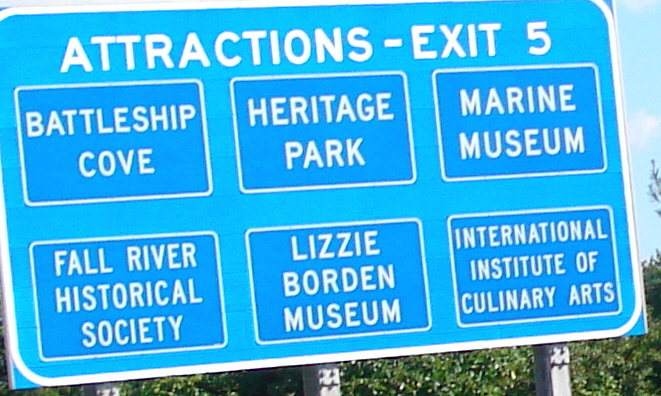 The approach to the Braga Bridge, Fall River signs on 195E (and also 195 westbound) feature a mention of the Lizzie Borden Museum and have done so for some time. Still garnering front page news is the continuing battle between Salem and Fall River over who owns the rights to the Lizzie Borden story, and the all-important word, “Museum”. Channel 25 Fox television out of Boston ran this segment yesterday http://www.myfoxboston.com/myfox/pages/News/Detail?contentId=7177254&version=2&locale=EN-US&layoutCode=VSTY&pageId=3.2.1 Sounds like several of those interviewed for the news clip might benefit from a visit to a museum telling the facts! No date has yet been given out for the Salem opening. Capturing the characteristics of a person in a portrait is never easy, especially when the subject is as well known as Lizzie Borden. 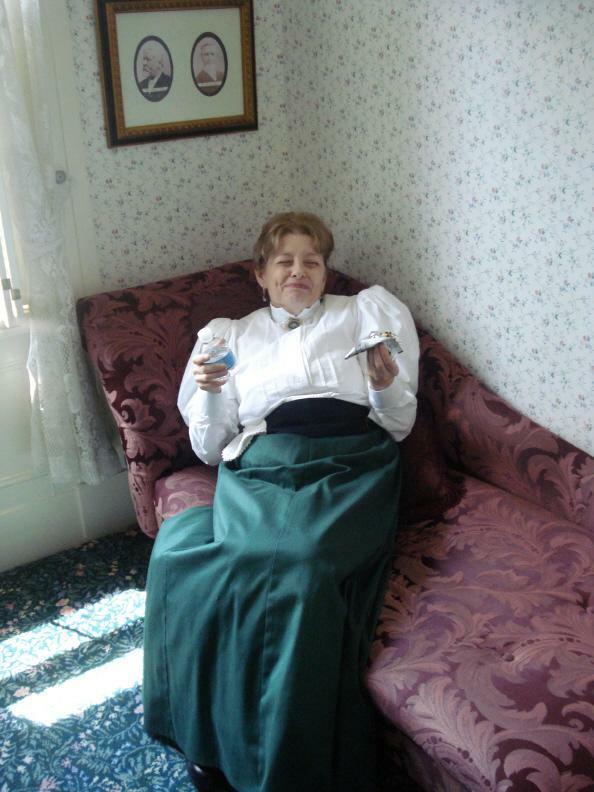 From late 1995-1996, Rochelle Pettenati, sister of the Lizzie Borden Bed and Breakfast Museum office manager offered her abilities and talent to create individual portraits for the house which was undergoing renovations to become a bed and breakfast under the management of Martha McGinn and Ron Evans. Antique oval frames were found and Rochelle got to work producing portraits for all of the rooms which were named for various key figures in the Borden Case. Particularly pleasing are the two portraits of Lizzie, who has never quite been adequately captured by other artists over the years. Rochelle painted the Swansea Farm, Uncle John Morse, Hosea Knowlton, and other incidental art around the house. Rochelle also appeared in the media dressed in Elizabeth Montgomery’s size 4 Lizzie Borden acquittal gown on loan to the house from Paramount Pictures and worn in the 1975 film. 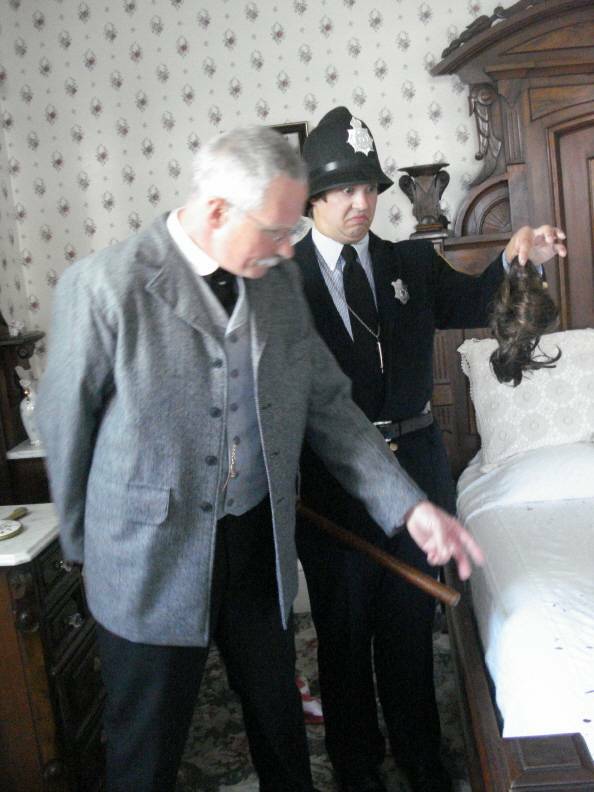 Plans are being made to install a 24 hour webcam at the scenes of the crimes in the sitting room and guest bedroom at the Borden house on Second Street. Interested viewers at home could then check in at leisure to see what was transpiring at any time of day or night in the sitting room, and the guest bedroom when not occupied by overnight guests. Followers of the paranormal are particularly excited by this prospect. The date when this experiment goes into effect has not yet been announced. 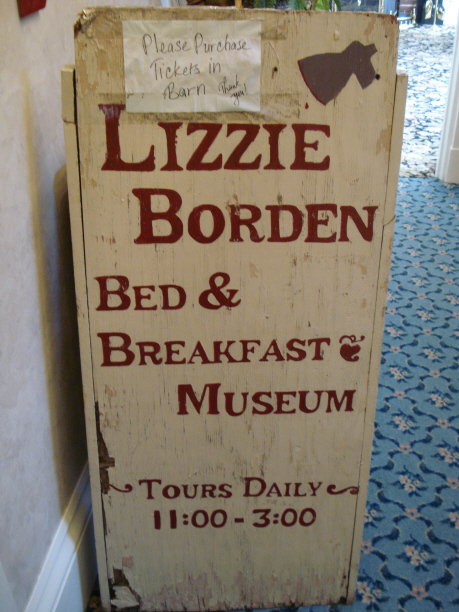 At one time the Lizzie Borden Bed and Breakfast had the word Museum tacked onto the end of its name and there were plenty of framed photographs with captions and signs on all three floors. 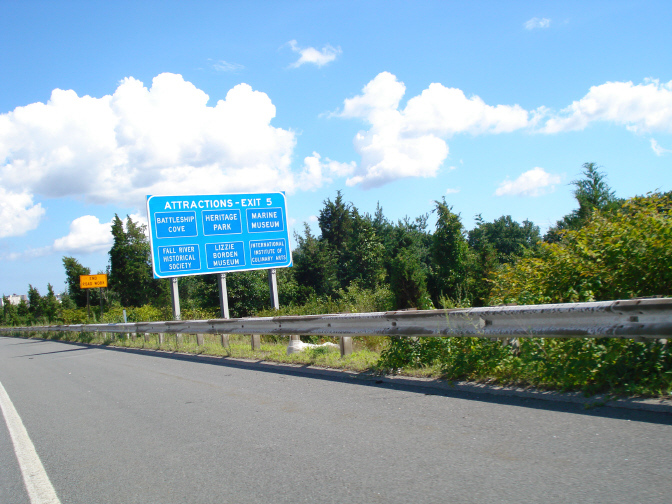 A few of these original signs survive today from 1996, and a couple of them always raise a few questions from visitors. 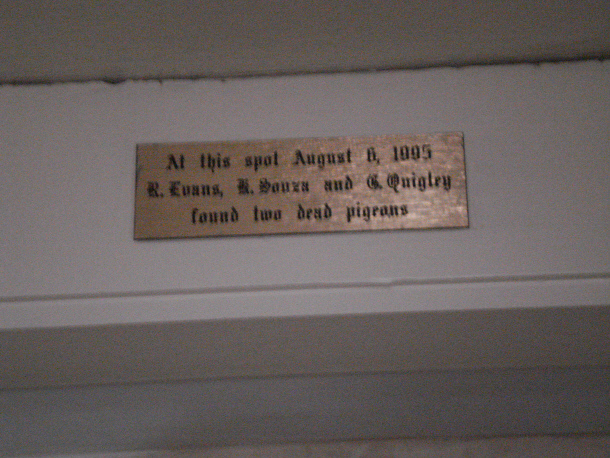 The brass plaque on the attic crawlspace refers to the story about Mr. Borden killing Lizzie’s fancy pigeons. Andrew Borden did twist the necks of the hapless birds and brought them into the kitchen to be cooked. When the air conditioning components were being installed in the attic, co-owner Ron Evans and his friend Ken Souza (a familiar name among Borden case enthusiasts) found the carcasses of two dead pigeons in the attic and decided to memorialize the moment. George Quigley, brother of longtime house chef, Dave, was an innkeeper and tour guide in the early years of the B&B. The next sign is pretty self-explanatory and can be found over the steep staircase at the front of the house. This sandwich board sign from 1996 usually sits out on the curb in front of the house, and the discerning eye can just note a drop of blood dripping off the little hatchet. In the years before the Borden barn was rebuilt as a gift shop and visitor’s center, the old Leary Press served as ticket window for day tours. 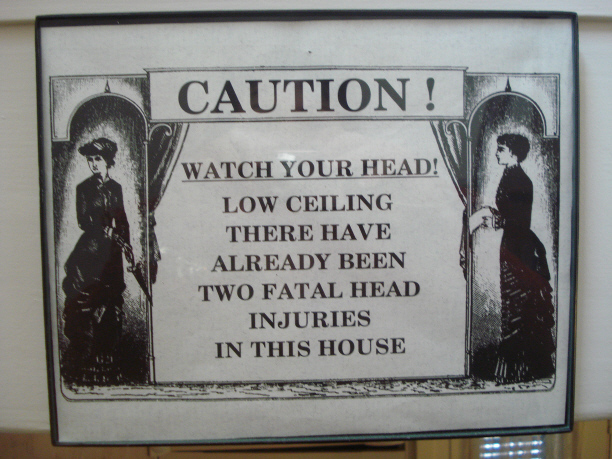 Two questions often asked by visitors at the Lizzie Borden Bed and Breakfast are: 1. Is there anything original left in the house? 2. 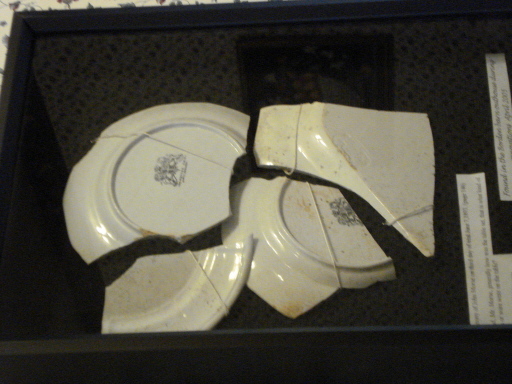 Why is there a broken plate hanging on the diningroom wall? The Borden sisters retained ownership of #92 Second Street until it was sold in 1918. How much of the original furniture was taken with them to Maplecroft in 1893, how much was put into storage, and what was left in the house is unknown. Anything which was stored is rumored to have been lost in a flood during a storm. There is nothing original left today. 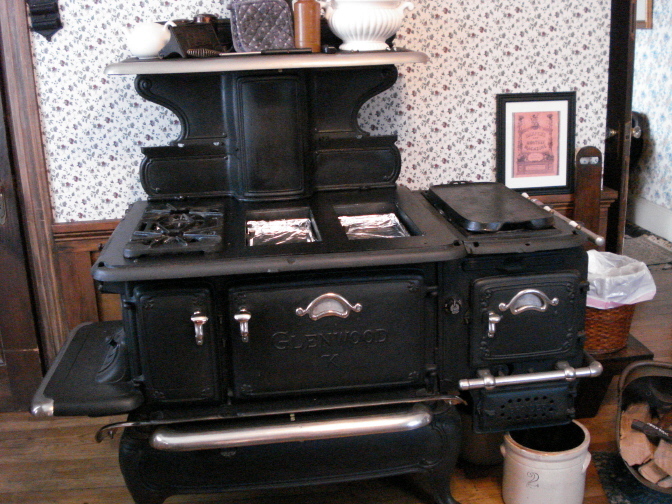 The Glenwood woodstove is a favorite item in the house and must be very like the one in which Lizzie burned that famous Bedford Cord dress on the day after the funeral of her father and stepmother and on which Bridget cooked the equally famous mutton for breakfast. This old woodstove was found rusting away in a field in Vermont and was refurbished and piped for gas in 1995. The white ironstone plate in a shadowbox in the diningroom was retrieved from the ground when the barn was rebuilt a couple of years ago. The location was in the backyard northeast corner of the lot where the barn privy had been located. What could not be burned was buried or tossed into the outhouse or privy vault. Many items of metal and glass and transferware plate fragments were found, including a broken doll commonly called a “Frozen Charlotte.” Lizzie was 12 when the Bordens moved into Second Street, but it is still fun to think it may have been hers. The Bordens used a practical white ironstone for daily use and this was on the diningroom table at the time of the murders in readiness for the noonday meal which never took place. 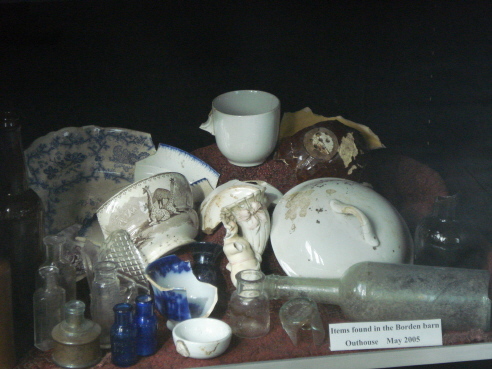 Many fragments of white ironstone crockery were found in the privy excavation including this plate, which may have been from the Borden’s cupboard.